Full list. 342 DVD threshold, 358 BD. 79 6 598 7,831 2 Yuru Yuri Nachuyachumi! Yeesh post took forever this week. Drrr s2 v1 sells 3228/2557, total 5,785. RIP. Sub-6k wk1 with an event ticket for what was a 18k series. Previous v1 sold 29k. 17 discs of free-fall to go. Kimiuso v1 sells 7348/2496, total 9,844. This will indeed be a 10k v1. Mostly the half price volume plus event ticket at work, but even if it drops a lot this is still much better than initially expected. Huge underestimation (67% DVD, 64% BD), Aniplex underestimation at work. Thankfully this is one of the last titles that applies to. Wixoss s2 v1 sells 2,500 BDs, DVDs do not rank. Assuming it won’t have the long tail (14 wks!) s1 did, this is in for a bit of a tumble. Still, if maybe 250 DVDs in the extended and another another 500 BDs coming, should get to around 3,250. But s1v1 did 4,866. Shirobako v3 sells 10381/417, total 10,798. Finally getting a handle on the stock situation. It’s just about at v2’s wk4 total. Wouldn’t be surprised to see the first three all hit 13k now. v1 adds 705 BDs, total 12,220. Hell let’s just predict 15-16k at this point, it’s never going to stop adding discs. v2 adds 814 BDs, total 11,947. Amaburi v3 sells 4969/607, total 5,576. Hopefully still on track for a 6k average. Nanatai v2 sells 2551/2835, total 5,386. 6.6k to 5.4k, not a huge drop, but this is also a ticket volume so the drop is still incoming. Crossange v3 sells 4680/459, total 5,139. Grisaia v3 sells 2966/489, total 3,455. Trinity Seven v3 sells 2302/620, total 2,922. Madan no Ou v3 sells 2255/552, total 2,807. Gugukoku v3 sells 1236/1278, total 2,514. Log Horizon s2 v2 sells 1891/463, total 2,354. Girlfriend (kari) v2 sells 1784/550, total 2,334. OreTwi v3 sells 1772/342, total 2,114. Terraformars v3 sells 676/253, total 929. DVDs from extended ranking. Inou-battle v3 sells 911, BD-only release. Captain Earth v8 sells 869 BDs, DVDs do not rank. One vol left to go, ~1.5k average expected. 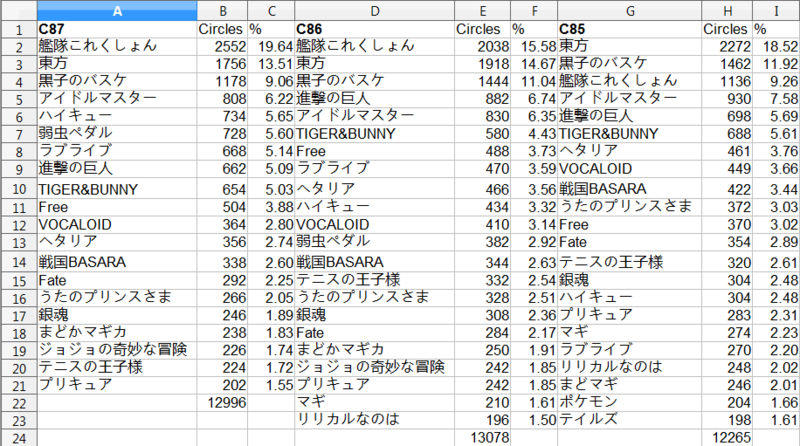 Daitoshokan v3 sells 767 BDs, DVDs do not rank. Ushinawareta v3 sells 381 BDs, DVDs do not rank. Denki-gai v3 sells 368 BDs, DVDs do not rank. Yowapedal s2 v2 adds 739/1039, total 10,608. Probably 11k with additional extended ranking weeks. Yuyuyu v3 adds 663 BDs, total 7,958. It’ll pass 8k in the extended rankings but I hope it can stick around this level for the remaining volumes. G Reco v3 adds 1032/194, total 7,958. DVDs from the extended ranking. Much bigger wk2 than last time softens the drop a little. Psycho-Pass 2 v3 adds 616/205, total 5,832. DVDs from the extended ranking. SAO II v5 sells 13914/2892, total 16,806. Almost identical to v4wk1, 13984/2892. Mahouka v8 sells 7283/1987, total 9,270. Nozaki-kun v6, final volume, sells 5914/2364, total 8,278. Series average: 10,384. Should end at 10.5-10.6k. Was already on the 10k list but now it’s even more official. Hanayamata v6, final volume, sells 2991/471, total 3,462. Up from 2.3k v5 due to event ticket. Series average: 3,461. By any measure that’s perfectly average, but it still hurts me. I wanted it to do so much more. Ahhhhhhhhhhh damnit I can’t wait for Ishizuka’s next series, whatever it’ll be. She directed two of my top 10 last year (this and NGNL) and my #2 of 2013 (Sakurasou). The wait is pain. Yamasusu s2 v6 sells 2,705 BDs, DVDs do not rank. It’ll end up right around Hanayamata levels, or slightly below. 3,346 avg at the moment with one to go. Locodol v6 sells 2053/224, total 2,277. DVDs from extended ranking. Rokujouma v6, final volume, sells 1455/265, total 1,720. DVDs from extended ranking. Series average: 2,100. ZanTero v6, final volume, sells 914/325, total 1,239. Series average: 1,380. Chaika s2 v3 sells 896 BDs, DVDs do not rank. Jinsei v6 sells 811 BDs, DVDs do not rank. Tokyo ESP v6, final volume, sells 201 BDs (extended ranking). Series average: 259. Haikyuu!! v8 adds 1643/1468, total 20,110. Back over 20k after dipping just below last vol. Free! s2 v6 adds 1383/1009, total 17,436. Might hit 18k with extended rankings. 21.4k average with one volume to go. Hyouka BD Box sells 8,093. Really damn good! Also justifies the crazy penalties Stalker applied I guess, since their estimate was 7,725. This one was very Amazon heavy. It was actually behind Hanayatama 3 of 4 days in the dailies, but of course vastly outsold it. That #1 pre-sale was probably 80% of its wk1 sales, which means we should expect fairly small wk2+. Still, ought to hit >9k in the extended rankings over time. Debuts at #27 in the BD box rankings. Assuming it does hit 9k, it’ll be in a big clump of KyoAni BD boxes that have had remarkably similar sales despite very different MSRPs: Clannad, Clannad After Story, K-ON!, K-ON! !, Lucky Star are all within a ¥22m range from ¥323-345m and across only 7 ranks apart at most. Hyouka might end up at the top of that pile, just barely and get to ~#20 ahead of K-ON!! although K-ON! still wins by unit sales. Uh, not counting Haruhi way way up at the top, of course. Nanoha StrikerS BD Box sells 7,952. All three Nanoha boxes were within 170 units of each other wk1. 1st should still end up with the highest total sales, but of course this will have the highest ¥ sales because it’s the only two cour season, thus the most expensive of the boxes. Enters the sales in ¥ list at #30. Should end up top 20 since it’s more storefront heavy than most boxes, and crushed its 4.7k estimate. Kuroshitsuji OVA v2 sells 3667 BDs, 3159/281 DVDs, total 7,107. Similar pattern to BroCon, higher wk1 for v2 of the OVA but probably smaller wk2+. Gintama BD Box v2 sells 6,609. Takes this to #10 on the sales in ¥, it’ll probably hit #5-6 due to being four boxes and a long show. Ginga Eiyuu BD Box re-release v4 sells 2,136. Ikkitousen OVA2 sells 1356/483, total 1,839. Amazing that it’s keeping up the naming convention, also that Ikkitousen still exists. High School DxD New BD Box sells 1,813. Shirokuma Cafe BD Box v1 sells 370. Sasameki Koto BD Box v1 sells 370. Only just dawned on me that this was DVD-only before, so I should re-buy it for the BD box. Done! So, uh, 371? kiss x sis BD Box sells 302. Tsukimonogatari v1 adds 517 BDs, total 30,684. Yuru Yuri OVA adds 544 BDs, total 8,909. 2nd highest volume now, only behind s1v1’s 11,196. Should pass 9k. Shin Tenipri OVA adds 548/1183, total 6,356. Personally I think the low sales in DRRR is due to competing with Kuroko no Basuke in the same season, since they are both mainly fujoshi series, and this group has limited purchasing power. If this train of thought follows, the next season of DRRR might not do any worse than this, or even do better. This is wishful thinking I do admit. I just don’t buy such an excuse. Where were you when Shingeki no Kyojin and UtaPri 2000% were in the same Spring 2013? They both have massive female fanbases, and yet they still averaged 52k and 33.8k. It doesn’t look like female fans have limited buying power to me. It is insulting to label the female fanbase of Durarara as fujoshi, when there are plenty of female fans who are not in fact fujoshi. Fujoshi is not a genre, so calling an anime a fujoshi series just doesn’t make any sense. Perhaps if the anime contained fujoshi in it, it would make sense, but we all know it doesn’t. High DVD sales is one of the usual indicators of a significant female fanbase (as many females don’t care about quality, although some have been upgrading to BD players). Then we take a look at the circle numbers at Comiket 79 to 87 (December 2010 to December 2014). Most of the franchises which have a significant female fanbase are in the top numbers of circles. We have KuroBas, Haikyuu! !, Yowamushi Pedal, Shingeki no Kyojin, TIGER & BUNNY, Free!, Sengoku BASARA, UtaPri, and Tennis no Ouji-sama. Yet, Durarara!! hasn’t been in top circle list for years… it was there at Comiket 79 to 81, before disappearing entirely. This just shows that Durarara!! just doesn’t have the same fanbase anymore as in 2010/2011. It was also evident in the steep slide in sales from Vol.1 to Vol.12 (Vol.13 had an unaired episode, so it had a boost). Perhaps if they made a sequel in 2012 or something, it would’ve sold better… but being 5 years after season 1 is just not doing it any favours. My explanation for the big drop in sales, is that the remaining fans it has has already moved on years ago and found something better to spend their money on, as Japanese fans typically only choose 2~3 anime series to invest in per season. I honestly doubt it. UtaPri 2 sold better than KuroBasu3 (will) and Durarara Shou (does) combined. There was also Karneval in that season. Agreed. I don’t think they have limited purchasing power. They’re supporting KuroBasu, Free!, YowaPeda and Daiya no A in one season. Basically what the rest said, Durarara’s popularity has just faded away with time. It happens. This just a rather severe case. Whatever phenomenon propelled it to such good sales was short-lived, and coming back five years later is just way too late. If anything the phenomenon was tapering off significantly before the first season ever finished releasing, with volumes dropping as low as 11k despite the 18k average.